I love this passage of scripture. 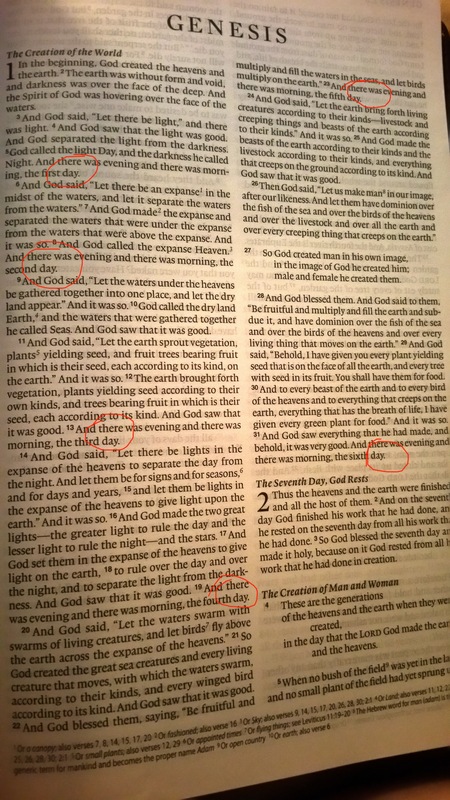 I’ve circled my favorite parts. See the red circles? I know it looks like I’m enamored with the word “day,” but that’s not it. See that little dot? Yes, the period. THAT’S my favorite part. If you ever listen to me talk, or preach, or pray you’ll notice that I talk with a lot (a lot) of commas. When I write, I am continually going back and editing out commas and adding in periods. The problem with a comma is it doesn’t let you stop, you just get to slow down a bit. And sometimes, we need to stop, not slow down, not pause, but stop. Period. If you doubt that, just look at how God created this world to work. Certainly He could have gone from one creative act to another, but He didn’t. I mean it’s not like He wore Himself out, and dropped exhausted to the ground at some point each day, unable to go on. Of course not. He chose to stop, to create a break between one thing and the next. Look at each creative series, “and there was evening, and there was morning, the first day.” “…the second day.” “…the third day.” I am SO glad that God put a period, not a comma after each day. My tendency is to go, and go, and go. But, when I look at the way God organized His creation of time I am reminded that there should be endings to our days, to our weeks, to our years. The end of a segment of time allows us the opportunity to start something new! God intended for us to live with periods, not just commas. I don’t know if 2015 has been a year of celebration or struggle for you, for me it has been some of each. But it is incredibly exciting to know that tonight I get to put a period on this page of life. No more reviewing coulda, woulda, shouldas. 2015 was a difficult year for my health journey, but it’s done. Period. And in His strength, I made it! Breathe deeply, rest securely, celebrate the period that He has gifted to us.